The placenta is the tree of life, an organ that plays an extremely important role at generating life. Many cultures around the world have honored placenta medicine and taken advantage of the emotional and physical benefits that placenta medicine brings. 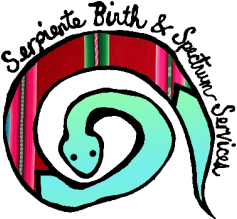 According to Andean culture, the placenta, the baby and the birthing person are interconnected. Therefore it is important to take care of the placenta to ensure that the parent and baby are healthy. Placenta medicine preparations vary from culture to culture, and even if you are not interested on ingesting your placenta you can find other medicinal and ceremonial uses for her. I offer raw placenta encapsulation and also Traditional Chinese Medicine (TMC) placenta encapsulation. In the raw food method, the placenta is not steamed or cooked in any way before dehydrating. The dehydrated placenta is then placed into capsules. This method is a good option for people that eat raw foods and for those interested in the freshest hormonal benefits of placenta encapsulation. Traditional Chinese Medicine (TMC) encapsulation involves gently steaming the placenta with warming herbs, ginger and jalapeños, then placenta is dehydrated, powdered and encapsulated. Each placenta is different in size, but one placenta might yield 90-140 capsules. The placenta is a beautiful organ, some call it the 'tree of life' since its print looks like a tree and its cord looks like a stalk and even root. Some of the placenta art I offer is placenta prints, cord and membrane keepsakes. A walnut-size portion of the placenta is tincture in alcohol for a couple of weeks, this increases the longevity of placenta medicine. According to anecdotal evidence, placenta tincturing to aids hormonal balancing after birth, support during menopausal years, increase energy and also use placenta tinctures on their children. 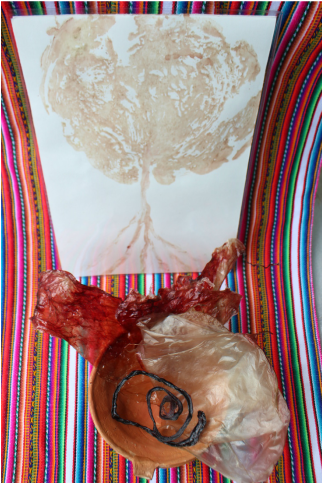 Placenta print, dehydrated chord and membranes keepsake. The beautiful placenta has been known to have healing and restorative qualities, it is contained in creams, shampoos and other beauty products, we can create a natural and healing salve using some of your placenta, organic ingredients and herbs. Placenta salve can be used for cesarian, perineal scars, diaper rash and as a general healing salve. Some people might prefer to honor their placenta by burning it, burying it and planting a tree over it. I can assist you through the process, give you helpful tips and even save some of your placenta to be tinctured, dehydrated or made into a salve.